TIJUANA, Mexico - The severed head of a young man was found hanging from a bridge in the Mexican border city of Tijuana on Monday. The Baja California state attorney general's office said the head belonged to a man between 25 and 30 years old. It had several bullet wounds and was hung using a metallic ring and a nylon rope. A threatening message was found nearby on the bridge. Hours earlier, a woman between 30 and 35 years old was found shot to death in another Tijuana neighborhood, also with a threatening message left nearby. Authorities have blamed recent cartel-style violence in Tijuana on feuding between rivals and loyalists of Teodoro "El Teo" Garcia Simental, an alleged drug lord arrested last January. Farther east along Mexico's border with the United States, Mexican soldiers on Monday found an unfinished tunnel under a house in the city of Nogales, across from Nogales, Arizona. The army's 45th Military Zone command said the tunnel was dug about 5 feet beneath the surface and stretched almost 100 feet, apparently just far enough to reach U.S. territory. The command said in a statement the tunnel ended abruptly and had probably been intended to move drugs across the border. The mouth of the tunnel was found in one of the rooms of the house in Mexico, which appeared abandoned. There were no arrests nor were any drugs found at the scene. Nogales is located in northern Sonora state, and on Monday unidentified gunmen shot to death the state's interim prison director, Erasto Ortiz Valencia, outside his home. State prosecutors' spokesman Jose Larrinaga said Ortiz Valencia died of three bullet wounds. He had been in office only 10 days when he died; his predecessor was fired after he was linked to the escape of a murder suspect. The assistant police chief of the city of Empalme, near the coastal city of Guaymas, was also shot to death Monday by a gunmen who fired an assault rifle from an SUV. In the Pacific coast state of Guerrero, police reported Monday that two boys ages 14 and 17 were shot to death in the remote mountain town of Alcozahuca, near the Oaxaca state line. The assailants fled after killing the boys with assault rifles late Sunday. 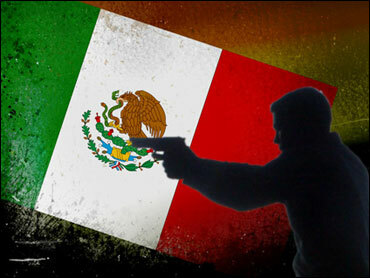 While there was no immediate evidence the killings were drug-related, Mexican cartels have been recruiting youths as young as 14. Also in Guerrero, police in the resort of Acapulco reported Monday they had found the bound bodies of four young men dumped on a main boulevard. The men had been killed with guns and knives and were found blindfolded and their hands or feet tied. Handwritten messages of the kind frequently left by drug cartels were found near the bodies, but Guerrero state police, in keeping with policy, did not release the contents of those messages.